May 8, 2014 | by Victoria Anderson, M.Ed. Students will punctuate dialogue by using the Toobeez Conversation Carwash. Build a “Conversation Carwash” (refer class and pairs to photo). Copy the dialogue in Step #3 on chart paper without the punctuation. 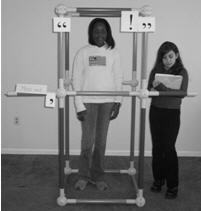 Use posterboard to create large opening and closing quotations, a comma, a period, an exclamation point and a question mark. Discuss the role of dialogue in writing and reading stories. Ask the students, “Why is dialogue important?” and “When should we use dialogue?” Discuss with students what happens if dialogue is overused. Teacher Note: Dialogue should be used sparingly and only to advance the story or reveal relevant information. 2. Review these punctuation marks and terms with the group before beginning the activity. * Quotation marks (“ ”) are used around a character’s exact words. * Speaker tags (he said, Carla responded, said the teacher) are used before, within, or after the direct character quotations. Speaker tags should include descriptive words and phrases that direct action. * A comma is used in most instances to separate the speaker tag from the quote. Review the examples to determine its placement. * Exclamation points, periods and question marks associated with a quote are placed inside the quotation marks. * Every time the speaker changes, remember to indent each new line of dialogue. 3. Review this example, omitting punctuation, on chart paper. Challenge: Students will punctuate dialogue by using the Toobeez Conversation Carwash. 5. Using the example sentences, “punctuate” them using the Conversation Carwash. Have one student read aloud each dialogue line. The student should read the written words, as well as the names of the punctuation marks as he or she comes across them. For example, the first line should be read as follows: Mitch said, comma, open quotes, ”My favorite food is pizza‘ period, close quotes. 7. Refer to photos on the following page for additional information. 8. Have volunteers read each quotation line in the same manner, and have other volunteers act out exactly what is being read. 9. With a partner, have students select a unique quotation line from a classroom novel and record it on a piece of paper. Then have students act out their selected line for the class. 10. After the activity, move to the “Activity Discussion and Processing” section of the activity. 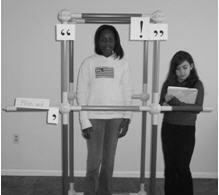 In pairs, one student “acts out” the dialogue (Student A) while the other recites the quotation (Student B). Student A is on the left and Student B is on the right here. 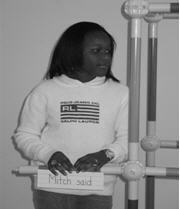 Student B says “Mitch said” Student A attaches Mitch said to the Speaker Tag tube. 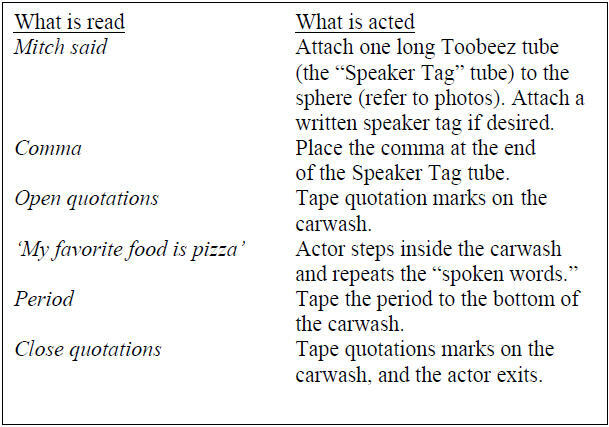 Student A attaches the comma and open quotations to the Conversation Carwash then steps inside. Student A repeats this sentence inside the Carwash. 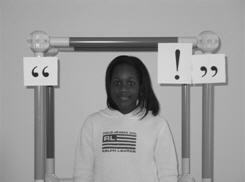 Student A attaches the exclamation point and closing quotations and exits the Carwash. Why is punctuating dialogue important? What role do you feel dialogue should play in a good story? Why is dialogue important for communicating with others? How did using the Toobeez help you to see the right way to punctuate dialogue? Do you feel you learn better by seeing and doing something yourself? 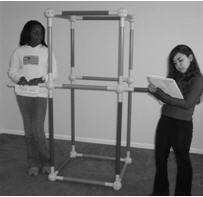 What challenge(s) did you face in trying to communicate in this activity? Build two Conversation Carwashes. When students have free time (perhaps when finished with another class assignment), have small groups of students write a conversation between each other and then act out the conversation.